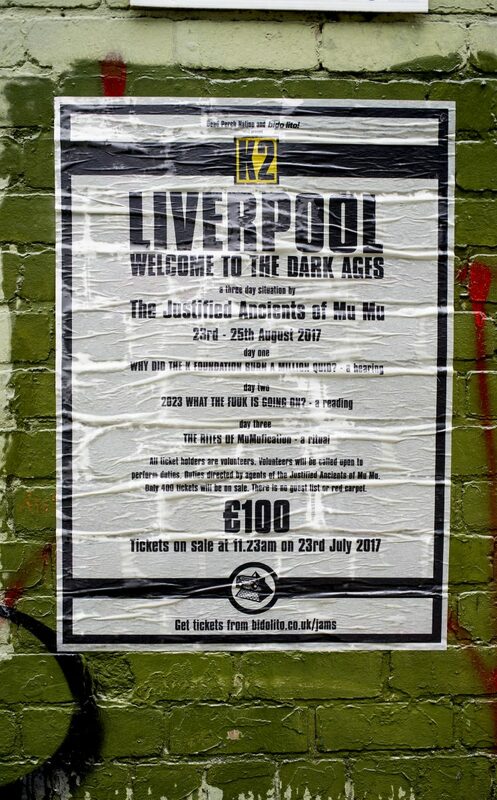 In just a few days the full itinerary for the Justified Ancients of Mu Mu’s three day “situation” to be held here in Liverpool, entitled Welcome to the Dark Ages will be unveiled. Just to remind you, this is open only to the 400 fortunate ticket holders (myself included) who managed to barge their way to the front of the virtual queue. There will be, we are told, “no guest list” and “no red carpet”. We lucky 400 are to be “volunteers” with “duties” to perform. This will not be a spectacle for us to passively observe like any other art show or performance. Our full participation is required. We are to be directed by “agents” of the Justified Ancients of Mu Mu (or the Jams, for short). Last week, ticket holders were sent an email containing some cryptic clues as to what is in store for us. Perhaps unsurprisingly, that email raised more questions than it answered. On the KLF fan forums there has been a growing disquiet regarding this, as evidenced by the number of tickets being offered up for re-sale at face value. Some of the 400, and not a few it would seem, have begun to feel rather nervous about what we’re letting ourselves in for, and the email does little to assuage those fears. To be frank, it appears to have been deliberately designed to exacerbate them, as if the initial trailer announcing the tickets wasn’t ominous enough. But firstly, some more mundane arrangements have been revealed. There are 3 days of activities which are accessible only by ticket holders, though proceedings will commence with a “book-stamping” (as opposed to a book signing) at News From Nowhere from midnight August 22, as we have previously reported. This is a world exclusive for the bookshop and it is open to all comers. Drummond and Cauty are due to arrive, in their ice cream van, at 23 seconds past midnight. Tickets will be exchanged for wristbands granting access to all planned events at the Static Gallery, to be re-christened as the “Dead Perch Lounge” for the duration of proceedings, and this opens at 6pm on August 22. This will remain open throughout the 3 days and will operate as a central hub for Welcome to the Dark Ages, serving breakfast from 9 to 11am each day, and providing refreshments at other times. “Volunteers” (i.e. ticket holders) are to be “initiated” at 1pm on August 23 at an as yet undisclosed location. The details of this will not be revealed until the wristband exchange. Intriguingly the email also gives some practical advice for Friday’s activities – a “ritual” referred to as “The Rites of Mumufication”. This will involve, amongst other things, “a slow paced walk of around 3 miles. Bring suitable shoes and attire. If you use an umbrella, bring one.” Nothing more has yet been revealed about what’s in store for ticket holders during the 3 days. All that is known about them is contained in the posters which have been appearing around Liverpool in the last few weeks. Elsewhere the email states that on Saturday the August 26 “there will be a presentation related to the Welcome to the Dark Ages activities…at 11:23 at the Dead Perch Lounge. Details will be revealed during the event.” This is outside of the already scheduled three day time frame. Some of this is plain enough. DJ Food has long been a keen advocate of the Jams and is a natural choice of guest DJ. So too is Greg Wilson, organiser of the 14 Hour Super Weird Happening held at Florence Hall in Toxteth on April Fool’s Day earlier this year, where rumours of the Jams’ Liverpool situation were rife, and several of which appear soon to be borne out. The reference to the Jams’ film is also clear enough. This was again announced earlier this year when two DVDs were taped to a wall near Bill Drummond’s London home, which had previously been the site of several Jams posters announcing their return this year. 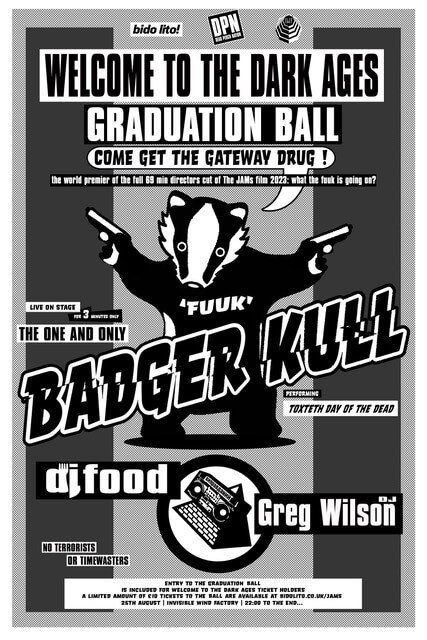 But the references to Badger Kull are the most mystifying. This is not a name previously associated with Drummond and Cauty. I suspect that it may involve the volunteers’ participation. The title of Badger Kull’s song, Toxteth Day of the Dead is also intriguing. “Day of the Dead” is, of course, a religious holiday and festival to honour the dead celebrated in many parts of central and South America (most famously in Mexico), largely amongst Spanish-speaking Roman Catholics. Its observance involves several elements, the most well-known of which is a carnivalesque parade in which participants dress as walking corpses. This seems to chime with the little that we know about Drummond and Cauty’s forthcoming book, in which the pair feature as “undertakers to the underworld.” But really, your guess is as good as mine. Putin features prominently in the 2023 trailer, alongside several cryptic references to the colour orange, such as an image of Alex from A Clockwork Orange. Taken alongside the phrase ‘Tangerine Nightmare’ which appeared on a mysterious poster that was pasted onto 9 Madryn Street (one of Ringo Starr’s childhood homes) and was presumed to be the work of Drummond and Cauty (or one of their associates), my guess is that Putin’s plus one may well be Donald Trump, or at least a look alike. As for “the Little Perch” and “the 23 Sparrows”, I have no idea. But the names Tat’jana and Kristina are familiar. These are the names of the members of the KLF who appear in the 2023 preface, set in alternative reality in which the band were a Russian female duo. If this all seems rather ominous and there are ticket holders reading this with some trepidation for what they’re letting themselves in for, and possibly with concerns about Drummond and Cauty’s intentions then I would just point out that they’re actually terribly nice chaps. For example, they turned up as surprise guests at Florence Hall in Toxteth last Friday to judge the entrants in a community gardening competition, and to decide who had made the nicest hanging basket. In the early hours of 23 August 1994, Jimmy Cauty & Bill Drummond, then operating under the name The K Foundation, burnt £1,000,000 of their own money, in an abandoned boat house on the Isle of Jura. The money was all the cash they had left from their careers in the music industry. The burning was filmed by a man named Gimpo, and written about in the Observer by a journalist named Jim Reid. People wanted to know why the K Foundation burnt the money. Cauty & Drummond did not have an adequate answer. Cauty & Drummond felt it was for others to tell them why. Cauty & Drummond signed an agreement to stop trying to explain the burning of the money for a period of 23 years. This was done to provide adequate time for others to tell them why they burnt the money. The agreement took on the name The Twenty Three Year Moratorium, and was backdated to the night of the burning. This moratorium will be complete on 23 August 2017. On the evening of 23 August 2017 a public hearing is to be held at The Black E in Liverpool, to find out if there is an answer to the question. This public hearing is to be chaired by the artist Tom James. 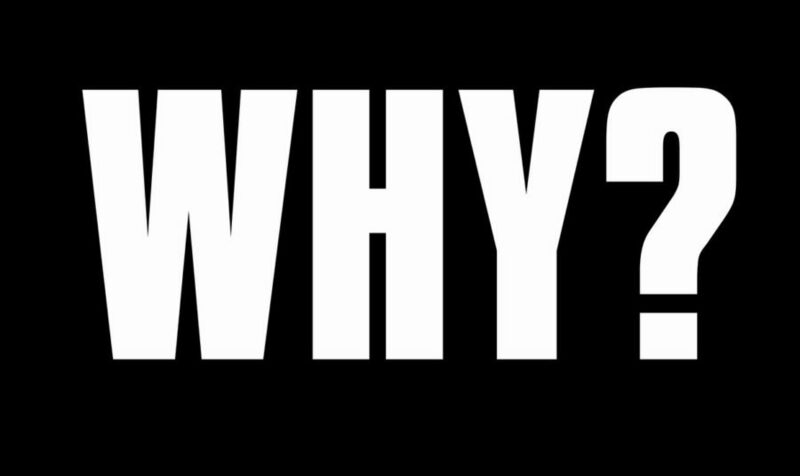 A panel of five people will be brought together, to each explain why they think the K Foundation burnt the money. The panel includes: Jeremy Deller, artist; Ann Pettifor, economist; Tom Hodgkinson, editor of The Idler; Annebella Pollen, art historian; and Clive Martin, journalist.